Want to see something exceptionally exciting?! Why, yes, it *IS* a new energy efficient water heater!! With earthquake straps and an expansion tank, and pressure/temperature valves in all the right places!!! We’re completely delighted. 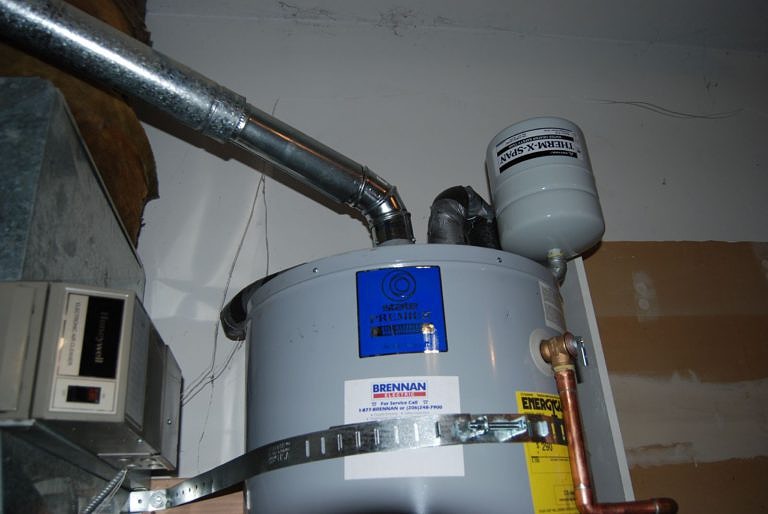 The Town of Redmond came to inspect it on Friday, there were a few corrections that the water heater company made on Saturday – but now we’re (probably) just one follow-up away from being up-to-code and good to go! For those of you who haven’t been following the saga, the water heater that came with the house turned 14 in May, according the paperwork duct-taped to the side in a plastic baggie. 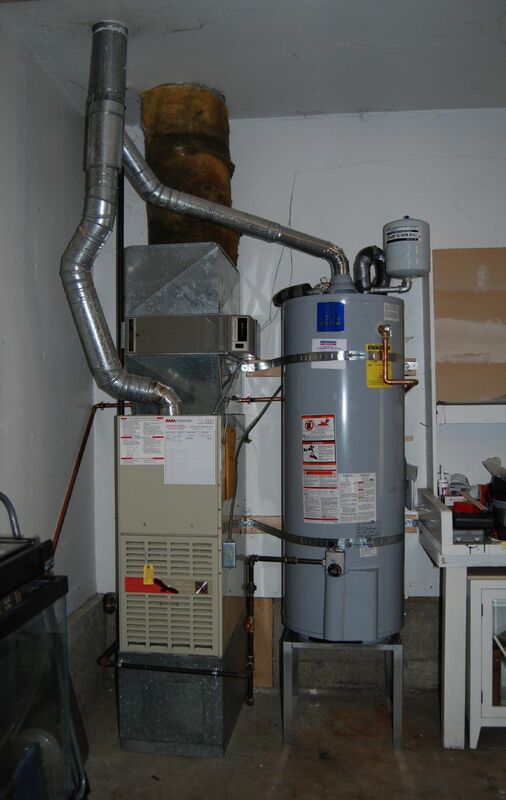 Our furnace (November ’93, according to its pedigree paperwork) shares ductwork, which needed to be brought up to code. The gas lines were out of date, and we had insufficient seismic support. Replacing the water heater was our first priority when we moved into the house. We wanted something energy efficient and with a long warranty. 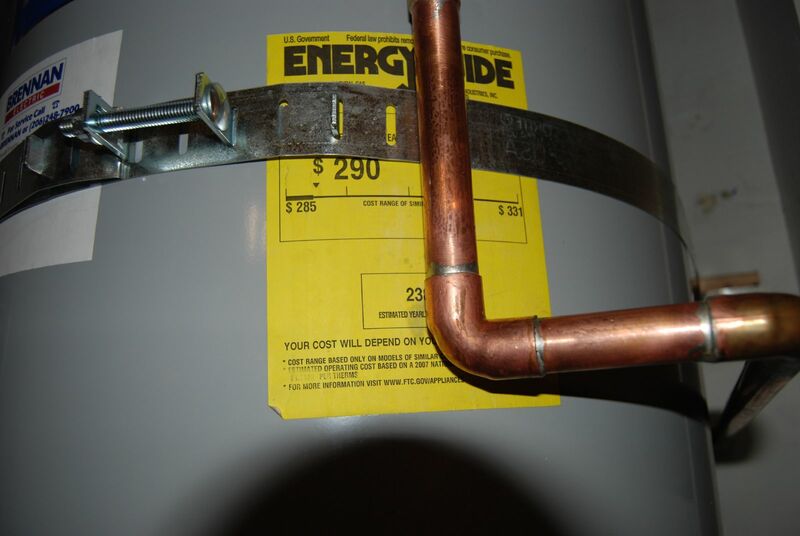 We started with Sears, bought a water heater, but they source out the installation to a local company that wanted to charge us $2000 to bring everything up to code. I spent two months trying to get our money back before I finally succeeded (moral of the story: avoid Sears, avoid Fast Water Heater Company). Kevin took mercy on me and took over, and we went through the guy who told us we were up to date and not to bother with a permit from the town (riiiight), and the company who special–ordered a water heater for us and then tried to install a different one and wouldn’t refund the money for the heater or the installation after the installer left with water heater in tow. We spent a few evenings roundly abusing the entire industry, threatened lawyers and small claims court (we got our money back), and leapt back into the struggle. So, THE most exciting things this week are insulation and water heaters? All sorts of things we’ve done have seemed like things that adults do (get jobs, pay bills, get married, buy a house). But to define happiness for the week (more like the month!!) as a new water heater and good insulation? Incurable adulthood. We are now old. 🙂 Rock on.